Keep dangerous leftovers or discarded foods out of reach or locked away in a trashcan so your dog can't accidentally ingest them. The best time to dog-proof your home is before you bring home a dog. Puppies and dogs explore with their mouth — and sometimes, their stomach. Knives, kebab skewers, balls, magnets, coins, needles, socks and almost anything else that can fit down a throat has been surgically removed from dog stomachs and intestines. You may need to get down on your hands and knees and check out a dog's-eye-view to see what dangers beckon. Uncovered electrical outlets, which can cause shocks when licked. Electrical wires, which can cause shocks, burns and worse when chewed. They can also topple lamps and appliances when pulled. Tape them together and out of reach. Do the same with long phone cords. Better yet, buy plastic conduit or flat strips of vinyl to cover them and hold them flat to the floor. Open stairways, decks or balconies, which can result in falls. Unsecured doors, which can allow your dog to escape outside, or can slam shut on him in a breeze. Swinging doors, which can trap a pup's head and neck. Fireplaces without a secure fire screen, which can lead to burns. Precariously placed statues or vases, which can fall on a curious dog. Hanging tablecloths that, if pulled, can bring dishes crashing down, possibly causing injury. Children’s toys, which may have parts that can be chewed and swallowed. Coins, especially pennies, which are made mostly of zinc. When swallowed, the zinc dissolves in the dog's stomach, potentially causing zinc toxicity. Open closets, especially shoe closets, which can entice a puppy or dog. Craft or sewing kits. These may hold needles and threads that can be swallowed, causing severe injury and illness. Open cabinets holding cleaners and detergents,which can cause poisoning. Accessible garbage pails holding enticing leftover food and splintering bones, which can lead to poisoning, sickness or gastrointestinal injury. Plastic wraps that can be swallowed and get lodged in the intestines. 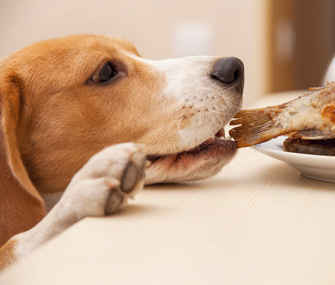 Foods and beverages such as chocolate, sugarless candy and gum containing xylitol, onions, grapes, raisins, macadamia nuts and alcohol, all of which have been known to cause toxicity in dogs. Pills and medicines; it can only take a few to poison a puppy or dog. Drain cleaners, which can be toxic or cause eye injuries. Razors, which can be swallowed, cutting up the mouth, throat and gut. Diaper pails, which hold disposable diapers that can be eaten and cause an obstruction. Antifreeze, which is attractive, but very deadly, to dogs. Even one swallow can cause fatal kidney failure in some dogs. Fuels, cleaners, paints, herbicides, insecticides and fertilizers, all of which can be toxic. Batteries, which can be toxic. Nails and screws, which can be swallowed and cause gut injuries. Rodent bait, which can be fatal to dogs as well as rodents. A weak fence, which can allow your dog to escape and be harmed. Puddles of antifreeze in the driveway. Rotted tree limbs that can fall on your dog. An unfenced pool, which can lead to drowning (always have a way for a dog to climb out and teach him to find and use it). Cocoa mulch — it contains theobromine, which is poisonous to dogs. Fruit and nut trees — some fruit parts are poisonous and nuts can contain fats and oils that can lead to pancreatitis. Pointed sticks at eye level that can injure eyes and other areas. Treated lawns and decks, which may have toxic chemicals that a dog may lick off his paws. Insect hives that a digging or playing pup could disrupt, potentially leading to stings or bites. Just as dog-proofing helps protect your dog from danger, it also helps protect your house and belongings from your dog. It's your job to keep your valuables out of his reach — if you find a precious item chewed up, blame yourself, not your dog!